For years and years, lunch almost always has been a toasted English muffin with turkey and Swiss. Sometimes lunch is leftovers (usually Sundays). Sometimes it's ham. Sometimes the cheese varies. But almost always it's muffin-turkey-Swiss. It's getting to me. I have been and still am quite unenthusiastic about lunch. We started roasting our own turkey breast instead of buying turkey lunch meat from the deli, but even that hasn't made it that much more appealing. Salad is just too much work for lunch, all that veggie washing and cutting. I tried a rice salad, just scoop and eat, but even though I like the individual components of that rice salad, somehow, together, I didn't like them. So this week I'm trying something new: a savory quick bread. 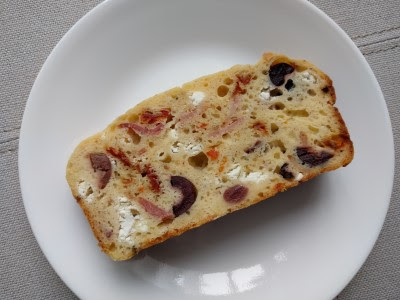 Specifically, Goat Cheese, Bacon, and Olive Quick Bread. It's a David Lebovitz recipe from the February 2016 Food & Wine. Happily there is no sugar in this bread. The savory ingredients include bacon, lots of cheese, kalamatas, and in our version, sun-dried tomatoes instead of red serrano chile. The bread is studded with lots of goodies. It's delicious. The briny kalamatas, tangy sun dried tomatoes, cool and creamy goat cheese, the bite of the parmesan, salty bacon. It makes for an easy lunch and a tasty lunch. I'd definitely make this again, but I couldn't eat it every day for weeks and months like I have been doing with the muffin-turkey-Swiss sandwich. I'll have to look for more savory bread recipes and maybe that can be my lunch for a while. Preheat the oven to 350°. Coat a 9-inch loaf pan with cooking spray and line the bottom with parchment paper. In a bowl, whisk the flour with the baking powder, cayenne, and salt. In another bowl, whisk the eggs with the buttermilk, olive oil, and mustard. Make a well in the center of the dry ingredients. 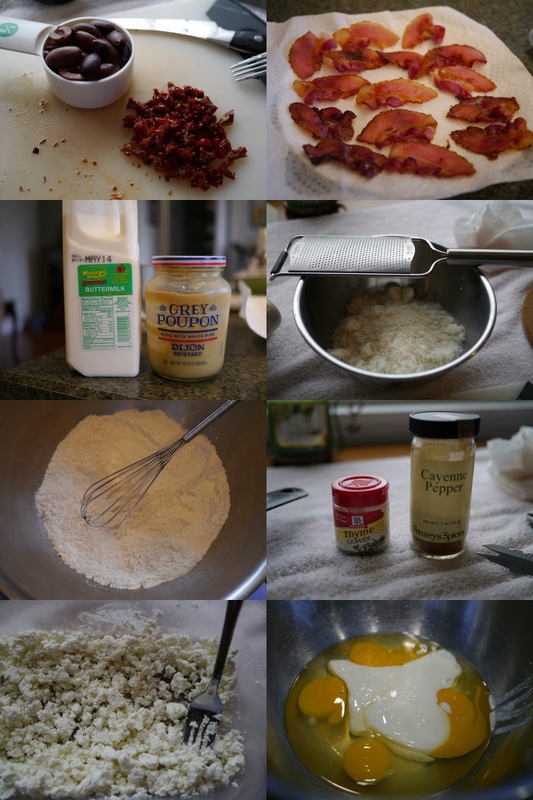 Stir the egg mixture into the dry ingredients until just combined. Fold in the goat cheese, parmesan, olives, bacon, and sun-dried tomatoes. Sprinkle in as much/little thyme as you like. Scrape the batter into the prepared loaf pan and smooth the surface. Bake the bread until it is golden on top/a toothpick inserted in the center comes out clean, 35-50 minutes. Let cool for 15 minutes, then run a knife around the loaf to loosen it from the pan. Invert onto a plate and let cool completely. The bread can be wrapped in plastic wrap and then foil and kept in the refrigerator for 1 week.